Majestic mountains, wide-open grasslands, pristine lakes, and extraordinary wildlife, from Grand Teton to Yellowstone National Park, from the Shoshone National Forest to the Eastern Great Plains, Wyoming is beautiful and breathtaking. Natural wonders that have inspired everyone -- Native Americans, gold-rush bound 49'ers, and even occasional extra-terrestrials. 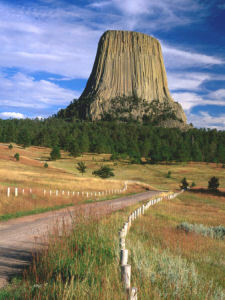 Wyoming's Devil's Tower is that awesome backdrop for the landing in the 1977 science fiction film Close Encounters of the Third Kind. Welcome to America in all its breathtaking natural majesty. Welcome to Wyoming! Legh Freeman, publisher of The Frontier Index in Kearny, Nebraska, claimed that it was he who first suggested Wyoming as the name for this portion of the Dakota Territory. 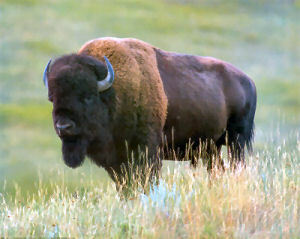 Wyoming comes from the Dakota "mscheweamiing" meaning "at the big flats" or "large plains." Wyoming was the first state to grant women the right to vote in 1869. This action lead to the nickname "The Suffrage State" and later to "The Equality State." "Equality" is also the state motto. This was the precursor to "The Equality State" nickname. It came about when Wyoming granted the right to vote to women in 1869. This term was given to Wyoming because of the wild sage that is prevelent in some sections of the state. Wyoming has officially adopted a cowboy on a bucking horse as a symbol of the state. This has lead some to refer to Wyoming as "The Cowboy State." This name references the size of the state of Wyoming; 10th largest state in total area. This promotional commentary pays homage to the rugged natural beauty of Wyoming, a state where the Great Plains meets the Rocky Mountains. People who live in Wyoming or who come from Wyoming are called Wyomingites. In 2004, Governor Dave Freudenthal formed the Wyoming Coinage Advisory Committee, which includes 13 Wyoming historians and other experts. The State invited citizens to submit narratives, and approximately 3,200 were accepted over a three-month period. Governor Freudenthal then recommended five concepts that were developed into design candidates by the United States Mint sculptor-engravers and artists in the United States Mint's Artistic Infusion Program. On May 12, 2006, Governor Freudenthal announced his recommendation of the bucking horse and rider design. The Department of the Treasury approved the design on June 22, 2006. 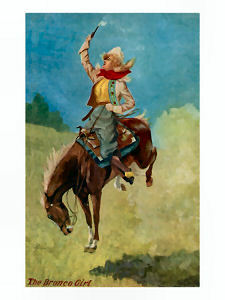 Four other designs were considered, including "Bucking Horse and Rider with State Outline;" "Bucking Horse and Rider with Teton Range;" "Bucking Horse and Rider in typical Wyoming scene," depicting a horse and rider on a ranch; and "Yellowstone National Park -- Old Faithful Geyser," featuring the famous geyser located in Yellowstone National Park. Wyoming (From Sea to Shining Sea) , by Alexandra Hanson-Harding. 80 pages. Publisher: Children's Press(CT) (September 2003) Reading level: Grades 3-5. Presents information about Wyoming's people, geography, history, landmarks, natural resources, government, state capitol, towns and cities, and more. Wyoming (World Almanac Library of the States) , by Justine Fontes and Ron Fontes. 48 pages. Gareth Stevens Publishing (February 2003) Reading level: Grades 4-6. Filled with the most up-to-date information, including the latest Census results. Full-color photos bring to life the story of Wyoming. In addition to an in-depth factual profile of Wyoming in the form of a state Almanac, this book offers fascinating and lively discussions of the state's history, people, geography, government, economy, culture, and lifestyles. A section on Notable People, a calendar of events, and enough primary source documents, time lines, maps, and other tools to make this unquestionably the best young adult reference material on the USA available anywhere. Wyoming Almanac 5th Edition , Phil Roberts, David L. Roberts, and Steven L. Roberts. 462 pages. Publisher: Skyline Press; Fifth Edition-revised edition (2001) A succinct and amusing guidebook to places, people, and events in the great state of Wyoming : with information on wildlife, sports, weather and more. Roadside History of Wyoming , by Candy Moulton. 440 pages. Publisher: Mountain Press Publishing Company; 1st edition (September 1, 1995) In Roadside History of Wyoming readers will learn about Native Americans who struggled to adapt to many sudden changes, mountain men who braved the wilderness, emigrants who suffered untold hardships, cattle and sheep drovers who took advantage of the open range, miners who sought wealth below the ground, and many others whose deeds help define the state's rich history. History of Wyoming , by T.A. Larson. 695 pages. Publisher: University of Nebraska Press; 2 edition (August 1, 1990) Reviewers hailed the original edition of T.A. Larson�s History of Wyoming (Winner of an Award of Merit of the American Association for State and Local History) as "a refreshing new look at the most western of the Western States," "an excellent model of what a state history should be." In that first comprehensive, critical history of Wyoming, the author was not concerned to recapitulate the familiar tales of fast guns and renegades associated with the pre-territorial years; his focus was on the men, women, and events which have shaped the state�s history since 18965, when the name Wyoming was first applied to the area. Although dramatic incidents and changes occurred in Wyoming from time to time during its territorial and statehood years into the 1960�s, the state remained preeminently a cattlemen�s domain and tourist mecca. Then the world energy crisis greatly enhanced the value of these state�s vast reserves of oil, gas, uranium, and coal. Unprecedented growth resulted (the state was losing population in 1965, when the first edition of this book was published), bringing expanded payrolls and wealth on the one hand and serious problems on the other as developers and environmentalists competed for control of Wyoming�s future. Visit the NETSTATE Wyoming State Book Store for additional Wyoming related books, including Wyoming Reference Books, History, Biographies and Cookbooks.